NEW YORK (CNNMoney.com) -- The Chinese Ministry of Commerce announced Sunday that poultry imports from the U.S. will face steep tariffs, the latest salvo in an ongoing trade war between the two countries. Following the news, shares of major U.S. poultry producers were down in early trading Monday. 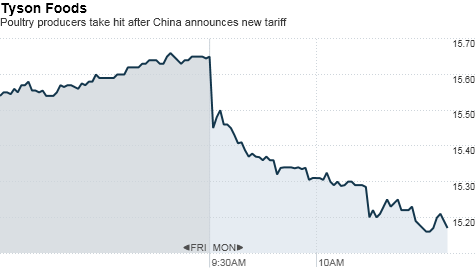 Hit by a tariff of 50.3%, shares of Tyson Foods (TSN, Fortune 500) dropped 1.7% to $15.38. Another major producer, Sanderson Farms (SAFM), was off around 1% to $41.11. The 35 companies singled out in the announcement will face tariffs of between 50.3% and 53.4%. All U.S. producers not named in the release will face a tariff of 105.4% percent. Sunday's announcement comes on the heels of a year-long study of poultry imports conducted by the Chinese government that it says found U.S. suppliers were dumping products into the Chinese market to the detriment of domestic producers. "The ruling is that there is a causal relationship between the U.S. dumping of broiler products and the losses suffered by domestic businesses," the ministry said in a statement. The tariffs went into effect starting Monday, for a five-year term. In August, China imposed a preliminary tariff of up to 30.3% on imported chicken products from the United States. So while Sunday's announcement might not have been a total surprise, its something that Assistant U.S. Trade Representative Carol Guthrie says is disappointing. "We are disappointed that duties are to be imposed, and [we] will be examining the determination for consistency with applicable rules," she said in statement. China's announcement follows action from the U.S. government in September that placed a 35% tariff on tires imported from China. The back and forth between U.S. and Chinese policymakers has grown more contentious in recent months, helped in part by the fact that Republican and Democrats in Congress appear to have found a rare patch of common ground on the issue. On Friday, the powerful House Ways and Means Committee voted in favor of a bill designed to address China's undervaluation of its currency. China said this year it would allow its currency, the renminbi, to trade in a wider range against the dollar. But the Chinese currency, also known as the yuan, has scarcely appreciated since then, inflaming critics who charge the undervalued renminbi steals U.S. manufacturing jobs. And as for the wisdom of instituting tariffs during tough economic times, a policy historians often argue made the Great Depression worse, Rep. Sander Levin, D-Michigan, says there is no reason for worry. "To those who would raise the specter of 'protectionism,' this legislation is indeed the opposite ... this bill is one antidote to remedy the effects of China's protectionist measure," he said.